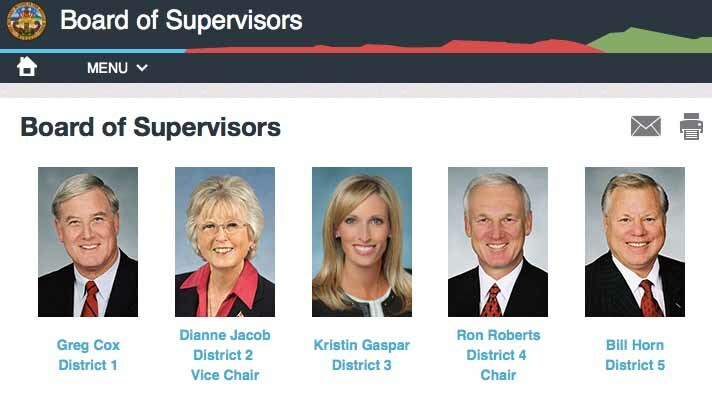 The San Diego County Board of Supervisors voted Tuesday to increase their own salaries by more than $19,000 a year, despite public comment by dozens of opponents. Newly seated Supervisor Kristin Gaspar cast the dissenting vote, as did her predecessor, Dave Roberts, when the raise was first proposed last month. The vote officially alters the way the supervisors’ pay will be calculated. They were making 80 percent of the base salary of Superior Court judges in California, or around $153,000 per year. The new formula raises the mark to 85 percent on March 17 and 90 percent one year from now. The first increase amounts to a 12.5 percent pay raise. Cuskaden was standing a few feet away from Roberts when she made the comments from the public speaker’s podium. Roberts was joined by board Chairwoman Dianne Jacob and Supervisors Greg Cox and Bill Horn in voting for the raise. All four are in their final terms on the board because of term limits. Imhoff appeared on behalf of the First Unitarian Universalist Church of San Diego. The pay hikes will cost the county an extra $17,688 in the remainder of the current fiscal year, and $88,438 for the next fiscal year. The supervisors will also get an increased pension when they leave office. Alexander-Myers said she is a 30-year county employee who will probably not be able to afford to retire. Before approving the salary increase, the supervisors unanimously elected Dianne Jacob as board chair for the calendar year 2017. Gaspar was voted in as the vice chair and Cox will serve as chair pro temp.